I will not make separate meals for kids. I, like every other new mother, told myself that frequently while my first kiddo was starting solid foods. I am not going to be that mom! They can eat what WE eat, or else they don’t eat. 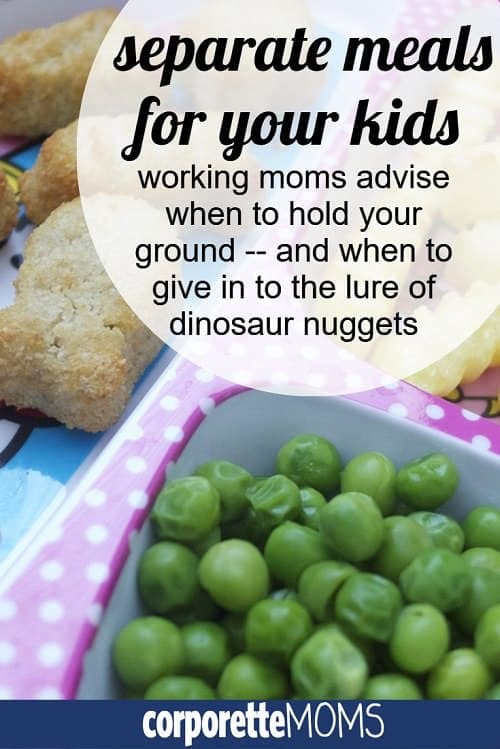 I don’t have time to do dinosaur nuggets! I absolutely refuse to raise a child who only eats macaroni and cheese! Cut to five years later, and almost every night the boys get a separate meal from what we eat. Dinosaur nuggets, no, but they do get the Dr. Praeger fishies pretty often. On our very best nights, the boys eat disaggregated versions of what we eat. If we’re having Mediterranean Stew with stew meat, tomatoes, and zucchini, the boys may get a bowl of broth (strained so there are no “green pieces”), shredded stew meat, and — if I’m feeling really crazy — a zucchini or two on their plate, perhaps coated in cheese. (It’s a crutch, I know! I’ve started splurging on real Parmesan cheese after reading about how many wood chips are in the shelf-stable versions, though.) Another version of a “win” for me is when I can use the same oven temperature (and, dare to dream, time) for the boys’ food as for ours. So, ladies — do you give your kids the same foods you eat, or do you make separate meals for kids? Have you “lowered” your own eating habits to meet theirs (and now enjoy dinosaur nuggets regularly) or have you just given in and embraced the separate meal strategy? For those of you who are out of this stage — share your tips with us; how long did it go on, and when did it end? -how to get your kid to eat, but not too much. i was helped out of the gate by the fact that she’s a hungry and generally flexible kid in general and i honestly dont know if i could follow through with all of this with a more difficult child or one that needs to gain weight. My kid was an adventurous eater until around age 2.5, when she steadily started restricting the range of foods she would eat. Many friends have had similar experiences. Just when you congratulate yourself for doing such a great job of raising an adventurous eater, the kid suddenly decides that she will eat nothing but Kraft Dinner and applesauce pouches. I have never had the energy to prepare my daughter an entirely separate meal, but I will frequently disaggregate dishes as Kat describes, remove her portion before adding spices or sauces she doesn’t like, or make her a simpler version of the dish we are having, such as a plain cheese quesadilla when everyone else is having quesadillas with vegetables. Sometimes I’ll serve her a different vegetable if it costs me little to no effort (baby carrots or frozen peas). We still eat a varied diet with lots of veggies and spicy foods, but I’ve pretty much stopped cooking a few things she particularly detests, such as beans. Once in a while I’ll also fix something that she loves but the rest of us don’t particularly care for, such as pasta with alfredo sauce. Yes! I forgot that one in our list of “wins” — I remove food before adding spices too. Or if we’re having buffalo chicken in the crockpot or something, before I shred the chicken and add it back into the sauce I can usually find some middle pieces of chicken to set aside for the boys that are pretty spice-free. yes ive heard that before too. all i can do is hope that a lot of interesting foods early will prime her to be a better eater later even if there is an in between period. it sounds like your kids are still pretty adventurous as things go. My kid is both adventurous and picky at the same time. She has gotten to the point where she will at least take a bite or two of many new things, but she doesn’t actually like a lot of them. Those she does like are weird things that most kids hate. She has a taste for expensive aged cheeses and regularly begs for sushi, which she eats with wasabi, but put a fish stick on her plate or lettuce in her taco and she acts as if you are trying to poison her. I totally agree with offering a lot of interesting foods early on. You do the best you can, and then it’s up to them. This was definitely true of my older daughter. She would eat anything and now is borderline picky. My son was a picky toddler and now is extremely adventurous. There’s only so much we can do. I’m a solo parent most nights, so the idea of cooking separately just for me is exhausting. We all eat the same thing, no short-order cooking and no special requests (unless planned out ahead of time). I always serve 3 foods. One is something I like, one is something they like, and one is some kind of fruit or veggie. So we might have tortilla chicken, jello, and green beans. Or quinoa, butternut squash, and a dinner roll. Or salmon, popcorn shrimp, and applesauce. And yes, chicken nuggets, fries, and peas. Sometimes if I find a cookie or chocolate, that gets added as a 4th thing, at the same time as the meal. They sometimes cry and whine that they don’t want dinner. I enforce the one-bite-rule, where they have to try a bite of everything and then can say no thanks, but otherwise let them choose how much they eat. They still have to sit at the table, which means I’ve had more than my fair share of eating-while-tantrum, but for the most part dinner is a pleasant experience. I will not feed my kids a separate meal. I do make sure there’s at least one thing on each meal that they are familiar with. But they eat what we eat. Sometimes what we eat is fancier or more complex, and sometimes it’s simple and kid friendly. But no matter what I don’t do separate meals. I don’t have time for that. And my 7 year old and 2 year old eat. And if they don’t like it, there will be another meal at some point. 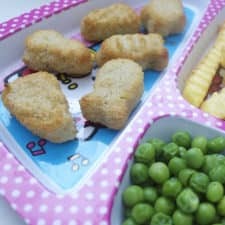 I’m not against nuggets or such, but there’s no way I will make my kids another meal on a nightly basis. I know it’s not for everyone, but that’s one thing that I just couldn’t do. Dinner is difficult enough without another layer of complexity. Same. I am already overwhelmed by getting one dinner on the table every night. I do the same. My 2 yr old gets a plate of what we are eating, or the basic components of the meal, and I try to serve something that I know she’ll eat (luckily she loves beef/chicken/pork from the crockpot). She doesn’t have to eat what is in front of her. I also offer her a fruit/veggie pouch about 30 minutes after dinner just so she doesn’t go to bed hungry – but she doesn’t always want it. Some nights she eats seconds and thirds, some nights she won’t touch a meal that she loved the last time I served it. My 2.5 year old always eats what we eat. I don’t force her to try everything, but, if there is a food she particularly loves (right now it is rice), she can’t get seconds until she eats some of her other food. She has done really well with this kind of “bargaining” since a very surprisingly young age (somewhere around one?). I do try to keep in mind what she likes, but we eat pretty varied food and she is very adventurous. We went to Europe last year and always ordered the weirdest things on the menu for her: squid, octopus, rabbit liver. She loves food! We’re really lucky. A lot of that is probably temperament and some of it is our own interest in food, but I also credit baby led weaning for her adventurous eating. She’s been eating what we’ve eaten since the beginning and I think that helps. I often find myself making a separate meal for my 21 month old because she eats dinner at around 6:30/6:45 and goes to bed around 7:30, and my husband and I usually can’t sit down for a meal for ourselves until around 8pm at the absolute earliest. It’s usually protein + fruit + veggie. Honestly, it’s the timing that kills us more than the food itself. At 6:25 we’re literally walking in the door and it’s a whirlwind until kiddo goes to bed – it’s walking/feeding the dog, feeding kiddo, cleaning up daycare food containers and preparing food for the next day, playtime, brushing teeth, etc. I think that if/when she starts going to bed later that we’ll have more of a fighting chance of having dinner together, and then I won’t be making a separate meal. We’ll often save leftovers for her next dinner (fully seasoned – not changing a thing about our food). We also give her things that we think she’ll like (right now she’s loving Dr. Praeger’s fishies with ketchup. I think it’s mostly the ketchup). We do try to eat a meal together on weekends, typically breakfast. This is our situation too–my husband and I get home late enough that kiddo has usually had some dinner already. The nanny does something pretty kid friendly most of the time–pasta, soups, PB&J with fruit or veggie side. But we often will have our son sit down with us later when we eat and have a bit of “second dinner” and try what we’re having. This works OK generally because he likes to eat and has a later bedtime; some night’s he’s not into it at all, though. This is our situation too. I said this yesterday, but Kiddo wants to eat approximately 30 seconds after walking in the door. I can stretch it to 10 minutes. If I give him a snack, he gets really upset that he can’t have more and then is too full for dinner, so we now give him “appetizers” of fruit and cheese while we throw together something resembling a meal for him. DH is a super picky, borderline gourmet cook/eater, so he really doesn’t like slow cooker meals or most other easy meals. So the timing just really doesn’t work for us. DH is going to start traveling frequently for work in a few weeks, so I’m going to try some slow cooker meals for me and Kiddo to have together when DH is gone. SC, I responded to your post on today’s thread with some quick meal suggestions. Not sure if you’d seen it. Hope it helps! This. Our nanny feeds the kids, it makes our life easier, then we eat after they are asleep. At some point i know we need to shift for family dinner but we haven’t done it yet. Yep, your description is exactly ours. I will sometimes eat with my one-year-old, meaning I graze on something so we are kind of eating together (last night we shared some cheese and crackers while he also had a peanut butter tortilla and some mango). We do feed our two year old separately mostly due to time and space constraints, though that may change soon. If we have leftovers from our dinner the night before, I will often offer that, but more often than I’d like she does get stuff like ravioli with meatballs, grilled cheese, PB&J, mac & cheese (sometimes with peas and tuna stirred in). I always offer some kind of veggie and fruit – sometimes she’ll eat the veggie, sometimes not. She’ll usually eat the fruit and a yogurt. I will fill requests for “sides” (yogurt, a particular fruit if we have it on hand, etc. ), but I won’t generally give her a different “main” thing than what I’ve prepared. Her diet most days is definitely blander than I’d like, but the one reason I’m not too worried about it is she does tend to be open to more strongly flavored foods when they cross her path. She love curry, salsa, spicy tortilla soup, capers, anchovies, blue cheese, etc. So I do try to offer things like that when I can. I keep waiting for her to do the classic toddler thing of no longer being open to all these various foods. It hasn’t happened yet, but I realize it still may. In the meantime, my only real hard and fast rule is not to force her to eat anything in particular and not to make a big deal of it if she won’t taste something. I’ll put whatever it is on her tray and if she objects I just say “you don’t have to eat it.” Sometimes she tries it, sometimes she doesn’t. Either way I’ll just offer it again some other time. I just don’t want to make food the subject of a power struggle, for both our sakes. The fact that she has been a “good eater” so far probably makes this a lot easier than it otherwise might be. This is our situation. Kiddo eats early, and gets a fairly easily put together, kid friendly meal. Husband and I usually eat later, often takeout, or eggs and a salad, or with minimal leftovers (I’d rather have them for my lunch than have them go on kiddo’s plate to not be eaten). Not thrilled with the situation, but it’s what works since we don’t have family meals. She’s good with her veggies, likes oddly flavored things — always wants all my olives and pickles. And, why I think she’s actually not a picky eater, eats everything at daycare and asks for more– and they have a much more adventurous menu than I serve her. We’re definitely in the “they eat what we eat” camp, and have been since they got off purees. They do still eat hot dogs and chicken nuggets at lunch, and occasionally we might make something that’s not really kid friendly (entree salads, mussels) and give them something else, but that’s it. We eat dinner fairly late, so if they don’t eat, they don’t get anything else until breakfast, and we really haven’t had a big problem enforcing that. FWIW, most of our regular meals are relatively kid-friendly, though (we like pasta way too much!). Spices don’t seem to bother them, but the older one wants to gorge on carbs while the younger wants meat, meat and more meat, which is funny. My 4 year old has definitely started to get more picky in the past year or so, which is frustrating and can result in more stressful dinners, but I don’t think that we’ll budge on not making separate meals. My 3.5 y/o loves mussels. It’s hilarious. My kid LOVES expensive cheese (especially Parmesan)! And expensive foods in general. I said this above, but DH is somewhat of a gourmet, so he thinks it’s hilarious. I’m equal parts amused and annoyed by my 1-year-old loving expensive food and refusing to touch things like jarred spaghetti sauce (he loves the spaghetti sauce that takes me hours to make, of course). Yes, my kid loves cheese…the stinkier, the better. Her grandma also recently introduced her to Perrier, which she inexplicably loves. And don’t get me started on their obsession with crab and lobster…mmm. This! My two year old turned down regular cheddar and wanted DH’s fancy/stinky double smoked cheddar. My kids eat what we eat. They are 3 & 1.5. I think the 3 year old completely refused dinner once, but otherwise they eat it. We do not have rules about having to eat everything, though we do ask them to try a bite of everything. (Daniel Tiger singing “Try new food, ’cause it might taste goo-od”). Sometimes they eat everything on their plates and want more. Sometimes they barely nibble. But they are pretty adventurous eaters and can stand spice. The oldest gets to order whatever he wants when we are out to eat. I like this topic! We generally eat the same thing as our 17 month old, but our pre-baby diets were probably pretty childlike anyway. If anything, having her and doing it this way has raised our eating standards – we’re definitely eating more vegetables and actual ‘meals’ and less frozen pizza and mac and cheese. She always gets a fruit (we usually don’t) and almost always gets a vegetable, whether she eats the veggie or not. So interesting. My kids almost always eat exactly the same thing we do. Usually it’s not fancy and we do dial back the spice. My kids eat what we eat. My 3.5 y/o is a great eater, so when there is something she doesn’t like, I respect it. But when it happens, it tends to be something DH won’t eat either (and she’ll say it totally independently of him). Neither of them like tomatoes (sauce is fine, just plain or very large chunks of tomato) or baked potato. My kid also doesn’t like French fries, hamburgers (veggie burgers are OK) or Tatar sauce. But she’ll eat almost anything else- some stuff with more zeal than others. I don’t like pot roast or salmon so I get that there are just things you dislike. She’s good about trying when we ask. I almost died the other day when I took her to Chick Fil A and she asked if they had mussels. Clearly we don’t do fast food often ;). My son has been “picky” from day ONE! Never ate any of the green baby food and it’s still a struggle to get him to eat anything green (he is 2.5 now). He usually eats earlier than we do since my husband gets home after 7 most days, so I feed him either some version of leftovers from the night before, or I make him a snack plate of something. One thing that has helped as he has gotten older is having him help me with dinner prep. If he helps to make it, he is somewhat more inclined to at least try what he made. Doesn’t always mean he will eat it again though. Typical foods are: sweet potato fries, eggs (scrambled or hard boiled), PB & J or PB & banana sandwiches, breaded chicken I make at home, hummus, any kind of bread, potatoes, one or two pieces of whatever vegetable we ate the day before (gets eaten 30% of the time), and green smoothies. I try to eat something while he eats his food, usually the vegetable he is eating to try to encourage him. Doesn’t always work. I will also mention that I am a registered dietitian, and all I can say from seeing many kids from all types of families is that some kids just don’t like certain foods! Just like us! And forcing them makes it so much worse. At the same time, including one new food or something that they don’t like that you have prepared for the rest of the family is encouraged. Unless they are very selective eaters, kids come around. In short (haha), I do usually make something separate for my son, but I try to make them very simple foods so that I am not spending a ton of time making something else. Our kid used to eat anything and everything until about age 4 1/2. Now he’s the stereotypical picky eater who wants only hot dogs, chicken nuggets, mac and cheese, and the like. I won’t make him a whole separate meal but will fix a sandwich, soup, or burrito for him, if he doesn’t eat what we eat. And if he doesn’t eat what we eat, there’s no dessert. My kids eat what we serve. We will do things on the side where practical (e.g., spaghetti sauce on the side, but I’m not going to deconstruct a stew or casserole). That means that they have gone without dinner many nights. My son has become very adventurous and will try anything; my older daughter will make herself try things often enough to be reasonable. My youngest daughter still sulks and refuses to eat more often than I would like. But, there is not enough time or money or mental space or mom patience to devote to making them a separate meal at night. They get to choose their breakfasts completely–we provide reasonably healthy options and they pick and generally make it themselves (not the 3 year old). We pick dinner. I’m on team no separate meals too. We try to only introduce one new thing per meal and make LO try it but do not require that he finish it. The only exception is if I want to make something more gourmet that includes an ingredient that I know LO hates. Does this get easier once they have more teeth? My daughter is 11.5 months and has two teeth on the bottom and that’s it. The problem with giving her “what we eat” is that a lot of what we eat (especially the vegetables) is legit hard to chew. Like, pieces of raw cabbage or peppers, steak, etc. It’s not that I’m afraid she’ll choke (I cut it into pretty small pieces), more that she gets frustrated by that stuff. And then much of what isn’t hard to chew is really spicy (we cook with a LOT of spice — like, many jalapenos). And it doesn’t help that she goes to bed at 6:30, which means 5:45 dinner, which means there is no way she is eating dinner “with” us. I think for this age you are totally fine!!! Their little mouths are too sensitive for lots of spice, and things that are hard to chew are not going to teach her to love and enjoy food. I am stressed out by this thread too. I feel like dinner is always just “flying by the seat of my pants,” and I don’t have any real philosophy. We have friends who invite us over for dinner sometimes, and they often serve salad or ethnic food or fish….and I always feel like a failure. My kid just doesn’t eat that stuff. Their kid is gobbling it down like it’s candy, while my kiddo begs for the snacks I carry in my briefcase. Oh my god, don’t stress out. To the extent you want to, you can just throw what you’re cooking for you into a food processor or blender (my $20 mini food processor was the best baby product I bought, other than maybe the RnP). Otherwise, it will just get easier. I try to feed baby (15 months) the same stuff as us for the most part but I don’t necessarily cook it the same way. E.g., the same veggies or proteins but I’ll cook our chicken with sauce and I’ll make a big pot of chicken soup for the kid (and would puree roughly or shred smaller when she had less teeth). Honestly, I worry a lot less about are we eating the same stuff than is she eating a varied and healthful diet. We could all be eating hot dogs and pizza but that wouldn’t be a great meal for either every night. It sounds like you’re doing great. (And yes – eating dinner together when your kid goes to bed at 630 is somewhere between silly and impossible. Don’t fret on that count either. Make your own traditions like big family breakfasts or lunches on weekends). i cant tell if you’re stressed bc you want to feed your kid a broader diet of flavors and dont know how or you dont have the time or inclination to do a lot wrt food. if the latter, don’t stress about it! everyone does things differently and has different situations. this is one thing i particularly care about. she gets minimal effort in others areas. if the former, there are definitely ways to feed flavorful foods to babies other than baby led weaning, which i know has its evangelists but completely freaked me out. again i recommend bebe gourmet or french kids eat everything which walk though how to introduce a lot of flavors to your baby. or talk to friends from cultures that eat a lot of spicy foods about how they ramp up spices for their babies. Even though I really do care about exposing my kid to range of flavors, I would try not to stress about it. And I’d be curious to know how many here developed a taste for things as an adult to which they had no exposure as a kid. As a kid in southern California, I was exposed to Mexican food early and often but other than that, our menu at home was pretty mainstream and not very adventurous. Roast chicken, mashed potatoes, pasta, burgers, steak, salad (with iceberg lettuce), grilled cheese sandwiches, etc. My brother and I probably ate our weight in Kraft Mac & Cheese and hot dogs many times over by the time we reached middle school. Now as an adult there are plenty of types of cuisines that I love that I never encountered before my teens or 20s. Sushi, Indian, Thai, Ethiopian, Chinese. It took me a while to come around to Thai, but the other I came to like pretty quickly. My mother still won’t touch most of that, but not being exposed to it as a kid doesn’t seem to have hurt my ability to enjoy it later. Following with interest. I have to say that I have largely given in to doing separate meals because of the time constraints mentioned by others above. I console myself in thinking that my older son eats relatively well, lots of fruit, yogurt, cheese, although he probably eats too many snack-type things. He also gets one “treat” (i.e. small piece of candy, cookie) a day, which is a firm rule unless it is a special holiday or we are at the grandparents. I don’t have the will to police what the grandparents give him, and its coming from a place of love so I look the other way. My only serious complaint is that he will not even try some things, especially vegetables. I try not to pressure him and stay relaxed but DH sometimes does try to convince him and if he does try it he immediately says he doesn’t like it. I asked him what vegetables he does like and he said, “french fries.” UGG! My mom tries to remind me that I was quite the french fry lover as a kid and I turned out alright. I’m trying to model good choices and eat veggies in his presence and hopefully one day he will come around….. I highly recommend the Dinner: A Love Story cookbook and blog if this is a hot button issue for you (and it doesn’t have to be – I hold no judgement for parents who go the separate/white foods meals route with their kids). But the author Jenny Rosenstrach has great suggestions about how to deal with a picky eater without feeling like you’re fighting/caving all the time. We lucked out with an adventurous eater – at 4.5 she eats just about everything we do as long it’s not too spicy. She digs fish and seafood, most cheeses, and eats a pretty wide variety of foods. We don’t always eat together as we get home from work on the late side, but she has eaten pretty well from the beginning (her face the time she accidentally got a hunk of wasabi was priceless). I think baby-lead weaning helped get us started on the right path when she was tiny, but other than that I think we just lucked out. She’s a voracious eater too, eating much more in a sitting than most kids her age, which I think also helps. She’s HUNGRY so she eats more of what’s put in front of her. All this to say, I applaud all efforts to encourage kids to eat the same food as the adults, just as it’s a huge timesaver, but it’s not worth killing ourselves over. And let’s be real, in most cases it’s the moms who stress about eating than the dads, so there’s an unfair burden there too (although my husband is a pretty good partner in cooking most of the time – he just doesn’t stress like I do on the logistics). CPA toddler eats whatever daycare provides her or what we eat for dinner. We do let her have yogurt with dinner pretty much every night, which she loves and is enough food to make me not worried about her going to bed famished if she doesn’t eat the rest of the food. No special meals here. We can barely get it together enough to cook for ourselves. That said, I ate like four foods when I was a kid and now I’ll eat pretty much anything, so all hope is not lost if you have a picky eater. My parents were not AT ALL adventurous eaters and we lived in a rural area with no restaurants, so we only ate pretty boring “american” food cooked within an inch of its life. I thought I disliked steak for years until I had one that wasn’t cooked well done. I have a 5 year old son. He eats what we eat and can always have bread and butter and he always has milk. We make sure to rotate in meals he enjoys – breakfast for dinner (eggs, fruit, toast), pasta, etc. Nowadays we’ll let him even choose what’s for dinner one or two nights a week. Comically, we’ll also let him pick a vegetable most nights, which he generally won’t eat unless its peas. He ate pretty much everything until he was about 3 and then got very picky. I see signs of his food choices regaining some variety. As a result, my son is a very healthy weight and is also not super-picky about what he eats (although he did go through those phases). We don’t argue about eating vegetables unless it’s zucchini, which he detests. But broccoli, green beans, butternut squash, acorn squash, asparagus, salad, etc. are all fine. He’ll eat salmon, tilapia, steak, pork chops, stir-fry, Italian food, Mexican food, etc. Or he doesn’t, and that’s no tragedy either. If they won’t eat, they’re not that hungry and parents shouldn’t make a big deal out of it. Just say, okay, and let them leave the table. I think letting him be in control of how much he eats is makes a big difference in his overall food consumption. Sometimes he cleans his plate and sometimes he eats two bites and is done, but that’s up to him. He knows there’s no eating after dinner, so on days where he’s hungry, even if the meal is salmon, zucchini and quinoa (one of his least favorites) he’ll eat it. Posting late to make anyone with a picky kid feel better: I did it all wrong. When my son (now 6) was an infant, my husband worked overnights, so he was asleep at dinnertime. So I fed my son the foods I knew he would eat, and waited until he was in bed to cook “real” dinner. This worked fine at first — my son ate a few different kinds of meat, all kinds of produce, and I congratulated myself that I was doing well. Then he started refusing his standard foods. So, stupid me, I stopped serving them. His list of acceptable foods got smaller and smaller By the time my husband was working normal hours again and we realized “oh, nuts, we have a picky eater,” the die was cast. We have slowly been working our way back. But most nights he does have his own dinner. Luckily, he would be content to eat a plain cheese sandwich every night for the rest of his life, so he eats that if he doesn’t like what we’re having. IMO, the alternative to the “real” meal should be verrrrry boring, and something that kids can make/fetch themselves from a fairly young age. All this to say: Don’t fall into my trap. My advice to parents of infants is, start them on eating what you’re eating. Have family meals. (If cooking with a little around is too much, cook a day ahead and eat “leftovers.”) If you want the little one eating meatballs with veggies in them, then everyone should eat them. FWIW, I was told that Bread and Jam for Frances would encourage picky eaters to try new things. It did not, in our case. My son just kept quoting the line from the book, “I won’t try anything new.” Thanks a lot, fictional hedgehog. I read this thread with considerable interest, though I’m not yet a parent. Kat, I’m extremely interested in the fact that you used to share my philosophy of no separate meals, but ended up changing. Can you (or someone else who was similar) describe how you made that shift? Was it a gradual wearing down or one big tantrum that made you drop the no-separate-foods rule? I’d like to be as prepared as possible when I have kids and so these comments are incredibly helpful.